[Weekend Poll] Can Google+ Succeed? This is the latest in our Weekend Poll series. For last week's, see How Much Cellular Data Does Your Device Use Per Month? This week, Google revealed its most serious attempt at social networking yet, Google+. Despite being released just a few days ago, it's easy to see that it's a much more accessible, polished attempt than Google's previous attempts, namely Google Wave and Google Buzz. It brings a familiar interface, but clearly bears the Google mark: clean, minimal, but with some well thought-out improvements. That's to be expected, given that the service is Google's next big push - they closed the beta rather quickly and only a small number of users have been invited thus far, all in the name of using a sort of control group to improve the service before opening the flood gates. As somebody lucky enough to be on G+, it seems that nearly everyone using the service has a positive impression (though most acknowledge that Google has more work to do). But is it enough to succeed where Buzz and Wave failed - and even more importantly, establish itself as a competitor to the 800 lb. gorilla that is Facebook? Sound off in the poll below, and feel free to share your thoughts or experiences (especially if you've been lucky enough to get into G+) below. I foresee G+ making it all the way to the top. It will do better than Wave and Buzz, but it won't be enough to unseat Facebook. I'm taking a wait-and-see approach. No. G+ is nothing more than a clone of Facebook and won't be enough to draw users away. No. G+ just isn't well executed. 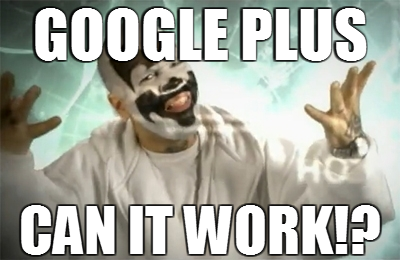 Google+? Facebook? I still use MySpace, brah.